Do you know what is one of the most important components of your commercial kitchen? Something that keeps it operating efficiently and effectively every single day? It’s something that you may not realize makes such a big impact on your commercial kitchen – it kind of flies under the radar…. Grease filters in commercial kitchens are a key part of your exhaust system. Their main purpose is to reduce the amount of vaporized grease that ends up within your exhaust system ducts. If grease filters don’t do their job well, and grease builds up in exhaust system ducts, damaging flash fires can result. Flash fires are not only dangerous for your staff and customers, they are also really expensive, because businesses are forced to close down while repairs are being made. 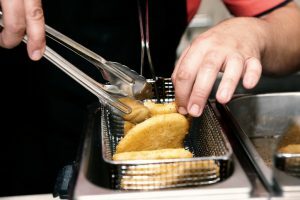 Don’t risk the safety of your employees and guests and the loss of valuable income – make sure your grease filters are always in tip-top shape so they always trap as much vaporized grease as possible. But it can be hard to remember to empty and clean grease filters on a regular basis. Face it – you and your stuff always have a ridiculous amount on your plate that needs to be accomplished on a daily basis. Who’s going to remember to take care of your grease filters? Plus it’s such an unglamorous, disgusting task that for sure, no one is going to volunteer to do it on a regular basis. That’s where Flue Steam comes in! Take grease filter tasks permanently off your To List, and confidently rest assured that your grease filters are always in ideal condition, when you partner with Flue Steam for all your grease filter needs. All you have to do is call us at 800-700-FLUE to begin grease filter exchange services. We’ll be happy to set up a regular schedule of appointments at convenient dates and times for you. At preset intervals of your choice, a qualified technician will deliver fresh, clean filter filters right to your commercial kitchen. The technician will also haul away the old filters for cleaning and install the new filters. We recommend that grease filters be replaced every two weeks, though if your commercial kitchen doesn’t utilize much grease or oil, you may be able to get away with extending the life of your grease filters to 4 weeks. It’s so convenient when you rely on Flue Steam for all your grease filter needs. We have plenty of new grease filters available for purchase in most sizes from top brands such as Kason and Flame Guard. We buy our grease filters in bulk so we can pass along the savings to you, our valued customers. Get complete peace of mind by partnering with Flue Steam for all your grease filter and exhaust system cleaning needs. Call us today at 800-700-FLUE.